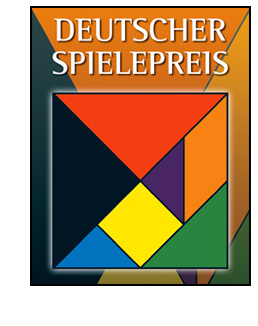 What is the Deutsche Spiele Preis and how do you pronounce it? Let’s take care of the pronunciation first, for those of you who don’t know German. Here is how you non-German speakers should say each of the words in the name of this award. If you can’t handle that, just call it the DSP. I got the information that follows from the German site here. What you’ll read below is a Google translation with some editing by me…because Google isn’t quite perfect yet. The readers of the magazines “Fairplay” and “Spielerei” [both German] are well-informed players involved in this election. Selected journalists of the television, the broadcasting, and the print media give their vote in appropriate leaderboards. Over 300 gaming circles in Germany, Austria, and Switzerland are also asked for their “best list”. Selected game shops each develop leaderboards according to their criteria. Since 2001, voting on the Internet is also permitted. To ensure that the GERMAN GAMES PRIZE is independent and visible, the evaluation is carried out by an independent institute. In the evaluation, only votes which are completely provided with name and address [are counted]. The institute also checks for double votes and sorts them out [removes them] if necessary. The GERMAN GAMES PRIZE organizes the expertise of thousands of gamers in Germany, Austria and Switzerland. Maybe I’m wrong here, but the above procedure seems to ignore American game players, doesn’t it? There must be thousands, perhaps tens of thousands, more gamers in the US than in Germany, Austria, and Switzerland. Do none of them have a say in who gets the DSP? I understand that this is a German prize, but shouldn’t such a prestigious award (and it is prestigious) go to the game and designer(s) who the majority of game players thinks deserves it? I don’t know what is involved in the Internet voting mentioned above, but the conclusion in that quotation still mentions just the three European countries. Thus, I have to assume that it just means that voters from those countries have the option of casting their votes online somehow. If the organizers of the DSP (which has been awarded for several decades) want to continue to limit voting to those three countries, fine. Maybe America should organize a similar award (the American Game Prize?) so we can see how well our tastes line up with those of our European gaming friends. ← Concordia Review: Can We All Just Get Along? Or Not?